The Ultimate Green Store is a marketplace of all things eco friendly and green! You can purchase healthy products for your home, pets, children and more all in one place. I love that the Ultimate Green Store takes the best of the Green market and pulls it together into one website for ease of shopping. You can easily read through the items and find the best Eco Friendly companies on the market today. 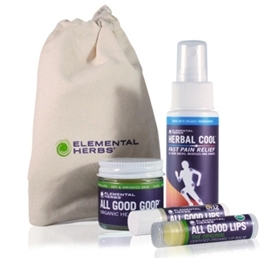 I reviewed the Herbal Healing Kit by Elemental Herbs. This kit is super for kids going to summer camp, family camping trips, weekend hikes, and other fun summer time events. Encased in a small bag for ease of taking along on the journey. And this is just one of the hundreds of items the Ultimate Green Store carries. You can shop by category or by brand, making it easy to find the exact products you are looking for. Don't miss out on their special and promotions, be sure to sign up for their newsletter. The Ultimate Green Store is offering a $15 GC in the Summer Fun Event Giveaway beginning July 8th! What would you use your GC for?